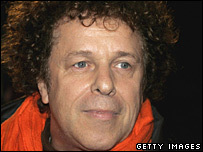 Seventies pop star Leo Sayer has walked out of the Celebrity Big Brother house on the day he was up for eviction. It is thought the 58-year-old quit the Channel 4 show after knocking down a door with a shovel. The singer, who was favourite to be evicted, is the third person to quit, following rock star Donny Tourette and film director Ken Russell. Model Danielle Lloyd said she thought Leo had quit because he was "worried about being rejected" by the public. Leo had become increasingly angry with Big Brother producers over the past few days. He was unhappy at the servant task in which eight celebrities were told to wait on Jade Goody, her family and three other contestants. He also accused producers of breaking the contract he had signed and demanded to see a copy. The final straw for Leo came when Big Brother refused to give him new underpants after he ran out of clean pairs. Leo's departure may anger some viewers who had spent money on phone calls voting for him to be evicted. There are now 10 celebrities left in the house and one more is due to get the boot in Friday's eviction. Voting lines for Leo have now been halted, leaving A-Team star Dirk Benedict and journalist Carole Malone facing eviction. Donny Tourette left the house after scaling the garden wall, while Ken Russell decided to quit after rowing with Goody and her mother Jackiey. Some housemates are already starting to speculate that a new arrival might be on the way. Despite the decreasing numbers in the house, a Channel 4 spokeswoman said there were no plans to send in another celebrity yet. Jade's mother Jackiey became the first person to be booted off the show by the public in a "surprise eviction" on Wednesday. Comedy actress Cleo Rocos is now 5/2 favourite to win, with Dirk second favourite at 3/1, according bookmaker Ladbrokes. Was it ignorance or racism?